Theater goers have learned that a show featuring puppets, isn’t necessarily aimed at children or even appropriate for them. Certainly Avenue Q drove that home, and it is reinforced in Hand to God, the comedy now at TheaterWorks through Sunday, August 26. The promotional material says that “you’ve been warned – This play is rated R for rude, raunchy, and riotously funny!” Certainly it is both of the first two; how funny you find it will depend on your sense of humor and your view about religious jokes. The premise is not new but playwright Robert Askins has used the underlying premise in a unique way: How do others react when an individual lets down the barriers of civility and civilization and says or does exactly what he or she wants to do or is thinking? Or as Freud would have said, what happens when the id (the part of the personality that contains the aggressive and sexual drives and is impulsive) takes over from the superego (which reflects the values and morals of society and whose job is to control the id)? This is, of course, a simplistic explanation of Freud’s theory. Authors have been using this technique for generations. Sometimes it is when a character is drunk or under hypnosis that his or her real thoughts come forth, other times a second personality takes over, and occasionally an outside force is the cause for the truth telling. (In the film comedy Liar, Liar it is the son’s wish that his Dad tell the truth). In each case the effects of this truth telling or revealing of desires and thoughts causes consternation, discomfort and unforeseen consequences. In most of these, the truth telling is liberating and the endings are usually happy. Such is the case in Hand to God. Jason is a teenager in a small Texas town, whose father has recently died. Jason seems like your typical kid that could be bullied. 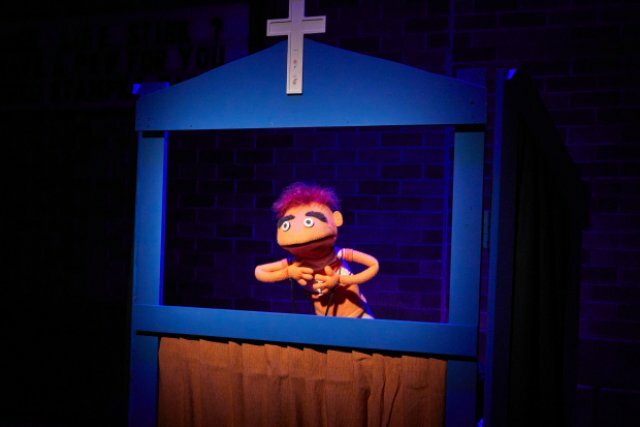 His mother (Jessica) has thrown herself into creating a puppet ministry at their local church, but all is not going great. Though Jason is attached to his puppet Tyrone, and Margery, another teen, is also committed to it, Timmy is the bad boy who belittles and seems to say whatever he wishes. The set-up is that Pastor Greg tells Jessica that in two weeks she must put on a puppet sermon/drama during services. That same night, Tyrone seems to take over Jason, expressing all of his pent up anger, his distress plus his sexual desires towards Margery. Tyrone’s language is definitely not that used in church and he seems to have little respect for anyone. In a sense, he is becoming like Timmy. But Jessica also undergoes a transformation. Without the benefit of the puppet she too reveals a personality totally at odds with her image as a God-fearing widow and mother. I don’t want to give too much away but she responds to the attentions of Timmy and the Pastor in unexpected ways. There’s a “bad girl” lurking underneath. Jessica and Pastor Greg respond to Tyrone’s takeover of Jason by considering a puppet exorcism, but no one know how to do it. In the second act, Askins has provided two very funny scenes. One involves two puppets and the other the destruction of the church school room. It would spoil the jokes to give more explanation. The language includes a number of four-letter (or equivalent) words from Tyrone, Timmy and even Jessica. Plus Tyrone attacks religion and God numerous times. This may impact your reaction and enjoyment of this piece. Hand to God is really a satire on some of the current trends in organized religion. Tracy Brigden has expertly directed this piece, keeping the pace moving. The piece is about 100 minutes including intermission. She has mined all the laughs. Certainly the cast is excellent. Nick LaMedica as Jason/Tyrone is outstanding. He manipulates the hand puppet so you truly think it is another character and that it is permanently attached to him. You are not confused when he switches between the two; his voice, tone, mood and body language changes. You know when Tyrone is dominant. As the bad boy Timmy, Miles G. Jackson does an excellent job. While you may know there is a sad, frightened teen underneath, he doesn’t let us in on that until the end. Lisa Velten Smith creates the perky Margery who tries to keep the peace between Timmy and Jason. The adult characters are more difficult because they seem less developed. Pastor Greg (played very well by Peter Benson) is too like a caricature of the smarmy preacher who doesn’t obey the rules he sermonizes about. It is to Benson’s credit that he lets us see a very lonely man underneath it all. Jessica is the most puzzling character. You can understand that her conventional appearance and actions may hide a more unconventional side, but how and when it comes out is problematic. With little preparation she seems to go from zero to ninety without any rationalization. It’s like she just “goes crazy.” Maggie Carr does an excellent job with this transformation, but it is hard to totally believe; perhaps it was overdone. As usual at TheaterWorks the set and projections by Luke Cantarella, costumes by Tracy Christensen, lighting by Matthew Richards and sound design by Elizabeth Atkinson are all excellent. The puppet created by Stephanie Shaw is appropriately demonic. Hand to God had a successful Broadway run, and several Tony award nominations. Even so, if you believe that religion should be treated respectfully or you dislike foul mouth puppets, this might not be the show for you. But for the rest of us, the imaginative jokes and wonderful direction will make for an enjoyable evening. For tickets, visit TheaterWorks or call 860-527-7838. This content courtesy of Shore Publications and zip06.